One of my favourite things at the moment is ankle socks with heels, but I think they need to be the right kind of shoes to make it work. Out of the shoes I own, I think the Chloe Silverado booties look the best with ankle socks. And yes, I do feel quite spoilt - those are a second pair of Chloe Silverado's I'm wearing! These and the brown ones are my two favourite pairs of shoes in the whole entire world. 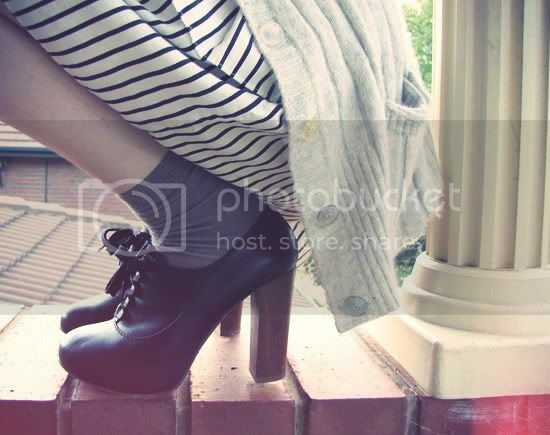 i lovelovelove socks with heels; i dont care what anyone says! although here in perth all i've ever gotten while wearing the two together have been strange looks...but in perth it's normal i suppose! Lovely pictures <3 And i adore those shoes! ohhh man whereeee do you keep finding these treasures!?!? I'v been dying for the silverado booties for ages ): I can never find them anywhere anymore!! ah lucky, not one but two pairs of those amazing shoes. looking great! Oh! Those boots are so beautiful; lusting after. If only I could afford them...oh and loving socks right now. Seriously. Oh wonderful shoot.... Very dreamy! your blog is amazing and these pictures are really sweet! Aah, I love socks with heels! You are so fortunate to have two pairs of those shoes. Lovely outfit, as always! I love wearing socks with heels, I'm doing that constantly. The first picture is so stunning! yeah, agree socks with heels !! they'r really cute, and love love the chloe heels! These pictures are dreamy. And those booties are killer. These pics are gorgeous! I am in love with your dress, too! 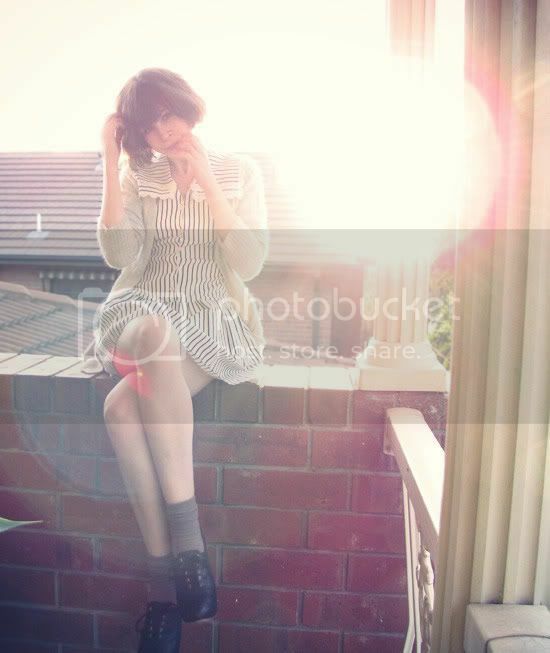 very cute style.. e especially love the picuters with the sun shinig in. I am a real follower and i will stay that! Oh, you are spoilt! I love the booties so much, and I love the photography here too. You know what, Sydney is the same, I always felt so self-conscious whenever I wore something interesting or different. One of the great things about living in London is how everyone appreciates fashion - I will never miss those 'up & down looks' I used to get in Sydney! Love the dress and the shoe and sock combo, so cute! cute outfit. the pictures are great and the shoes and socks! sigh... so cute! I'm rocking the socks with heels look at the moment too - great for fresh mornings when you want to have warm feet! Looks so cute as well. You look fierce! ahhh i LOVE your sailor dress! too cute. you have such unique and cute style, and a very chic and clean blog. must follow now! I love the booties! And ankle socks too! I can't imagine that just a few years ago, ankle socks and heels were considered a fashion faux pas! It really shows how fashion has evolved over the years! These images are beautiful! I love your booties! Those shoes look so gorgeous and the socks perfect the look. Your second pair - I'm so jealous! I've been on the hunt for ages! Where do you find them?! Loveeee your style! I love this outfit - I would kill for that sweater and those boots! You also must have very slender legs to pull of the ankle sock and heel look, which you do very well, by the way. 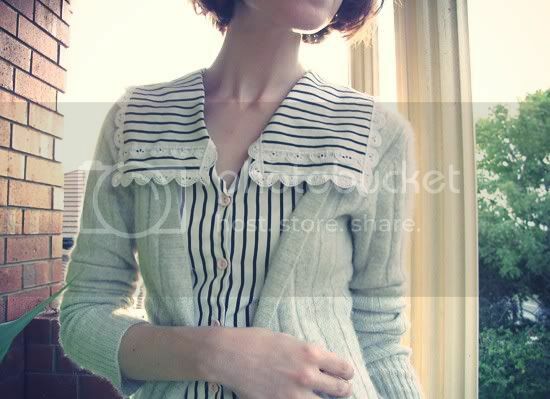 Terrific sailor blouse, and it looks perfect with the sweater! Do you find these to be true to size? Or did you go/up down a size? i love your little dress, fierce chloe heeled oxford shoes, and darling socks. the cardigan is a sweet touch too. happy to find your blog. good stuff here.